I'm sure many of you have heard of The Black Apple and The Black Apple Doll. I made one for my oldest for her Easter basket two years ago. I was going to wait one more year to make one for my youngest, but she is suddenly quite smitten with the first one that I made, so I went ahead and made one for her Easter basket this year. The one on the right is the one I made back in 2009. She is named "Marge" after my grandmother because that bold black floral number looks like something she could have pulled right out of her closet. The one on the left is the doll I made this weekend. She is named "Billie" after my other grandmother. Both of my grandmothers were gone before my girls were born, so these dolls are a nice conversation starter to tell them a little about who their great-grandmothers were. The hair is wool felt, and I painted the faces using acrylic craft paint. I added a little note to their bottoms with a permanent fabric pen, a reminder to my girls that I spent hours making these for them I love them. They turned out beautiful, what a nice idea for an Easter Basket! a very meaningful gift. ADORABLE! 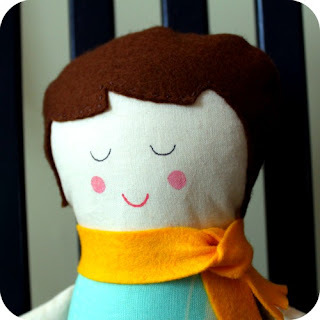 I need a girl to make a doll for!!! I have always loved this doll. Now only if I wasn't so darn scared to sew more than a napkin or drawstring bag I could make one!! How special! I still have a fabric bunny doll that my aunt made me when I was young...I wonder if it's ok to make boys dolls? Oh they are SO cute. I haven't made one of those in a while - such a fun project. Thanks for sharing. 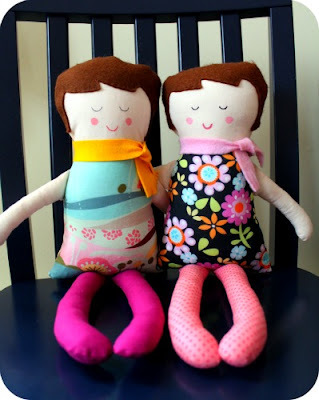 I would love to make these for my stepdaughter1 Thanks for the ideas! They are adorable! I love it! I've been meaning to make one of these for my daughter, but haven't gotten to it yet. Good idea to make them for an Easter basket! And I love that you did the grandmother thing. Super cute idea! this is such a fun idea for an Easter basket. And I love that you named them after your grandmothers. I have a doll that my great-grandmother made for me and she sits up in a closet so she doesn't get ruined. I think I need to pull her out and start some conversations of my own! so sweet, we love our black apple dolls (or at least I still do). great project! Gwen, they are so cute...and I love their names! These are adorable! I think they will definitely be something your daughter's treasure for years to come. So cute! You really should consider opening an etsy shop and selling your beautiful creations!!! 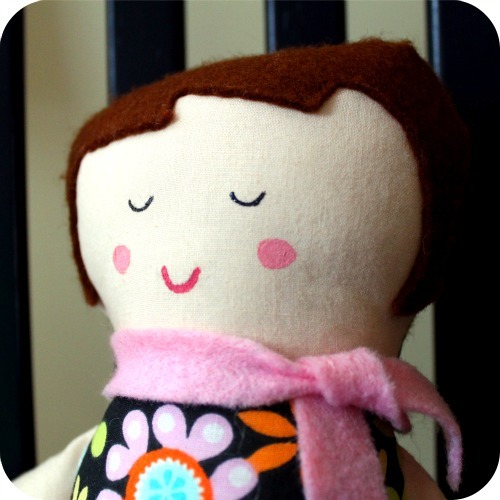 love black apple and her dolls!! What a great idea for Easter! They are both wonderful and i love their names! 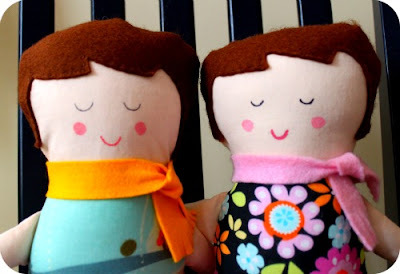 I love Black Apple dolls and made some for my little girls two Christmases ago. I love that you signed yours! What a neat idea. Those are great! I want to make one but haven't worked up the nerve yet. I love Emily's work! I've got several of her prints in my studio. I've thought about making one of these dolls for my niece, but I just haven't gotten around to it. She turns one in July and I think this might be perfect. I'll be sure to do it with red hair to match Miss Ava's!